Must there be only one? As geeks, we all remember the classic bit from Highlander (I won't say the first, because I prefer to live in my own reality ("I reject your reality and substitute my own" - Adam Savage) where the god-awful sequels don't exist - "There must be only one". Is this true however? I don't think so. Yes you can play other games. 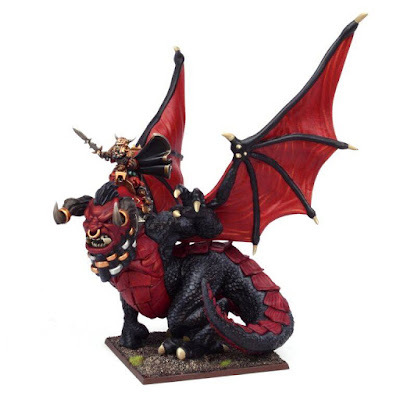 And yes you can buy miniatures from other companies. Heresy you say. Blasphemy!!! Burn his miniatures at the stake! But even a die-hard Mantic pathfinder (pronounced fan-boy) like myself occasionally needs to get other minis. This is especially true for armies that Mantic does not make themselves - which now includes all 33 lists in the Historical book. 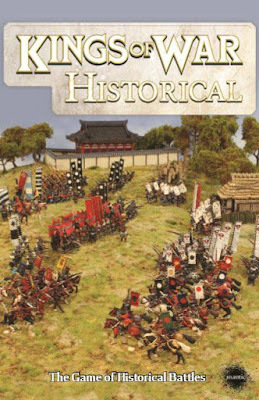 I am still amazed at how popular historicals are (yes, I thought it was mainly old grognards who played them), and even more so how excited I got about them - because in the past I have hated painting humans. But when I first went through the book I decided I needed to have two armies so I could demo the rules. After a while I decided on Celts (or Babarians in the book) and Romans - in part because I was able to find plastic miniatures (from Warlord games) for the armies, and these two fit together (i.e. it made sense for them to be fighting, as opposed to Crusaders vs. Egyptians). My three boys bought me a Celt army for my birthday ( which took less than a week to come in from the UK), and my wife bought a couple of units of Romans (one of which has still not arrived from a store in the US - go figure). It occurred to me that I like to show the models for all the Mantic releases that I get - so why not for Historicals? 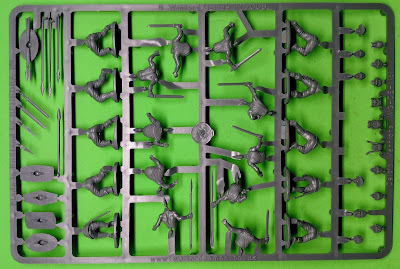 So first off is the celt warrior sprue. Warlord is using Renedra to cast their hard plastic sprues, so the quality is top notch. Mantic used Renedra for their earlier products before they started having them made in China - and the first two sets that came from China (Goblin spitters and Basilean Men-at-arms) are some of the lowest quality plastic sprues I've ever seen). Sharp detail - and I notice a 'style' on how the sprue is laid out. I started then looking in detail at the sprue. There is not much variation in weapons - all but two bodies are already holding swords or spears. There is a great selection of heads however - 15 different heads for 10 models. I was disappointed when I found that there are only shields for half the models. 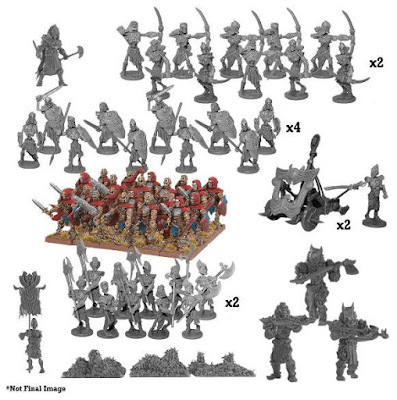 I looked on the warlord site an they do sell packs of shields - but I shouldn't have to buy an additional pack of 20 shields for each box of 40 models. 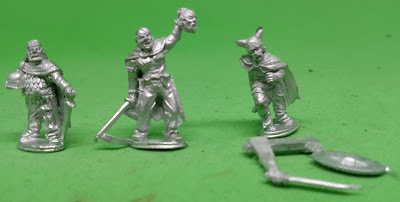 The command sprue is Identical to the warrior sprue except for the area where the heads are - which is replaced by two standards, a horn, and some severed heads (I guess for a unit champion to hold. 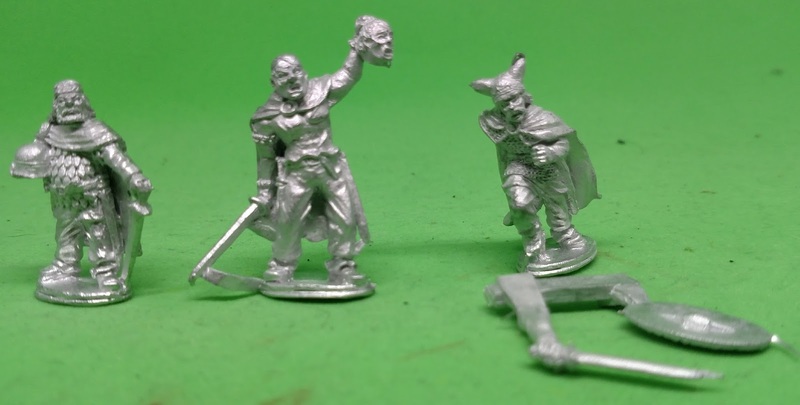 But no heads - so the great variety now gets cut down, as you get 45 heads for 40 models in the box (and again 20 shields). There is only one horn - so my plan to make 2 regiments from each of the three boxes will mean 3 of them don't have musicians (without pulling bits from other kits). One thing I've notices browsing some of the sites for historical miniatures, is they seem to like to use decals for shield decorations. A pretty cool idea - and there are 5 extra decals as compared to the number of shields in the box. 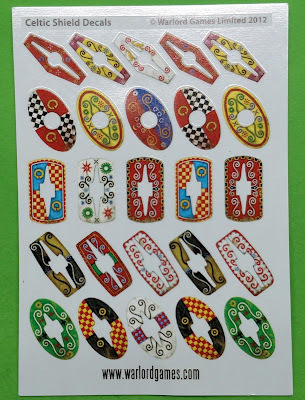 However for the 130 (6 regiments of warriors, 1 regiment of cavalry) I have a total of only 100 decals - so I'll have to get two more sheets of these to fill out the army as well. 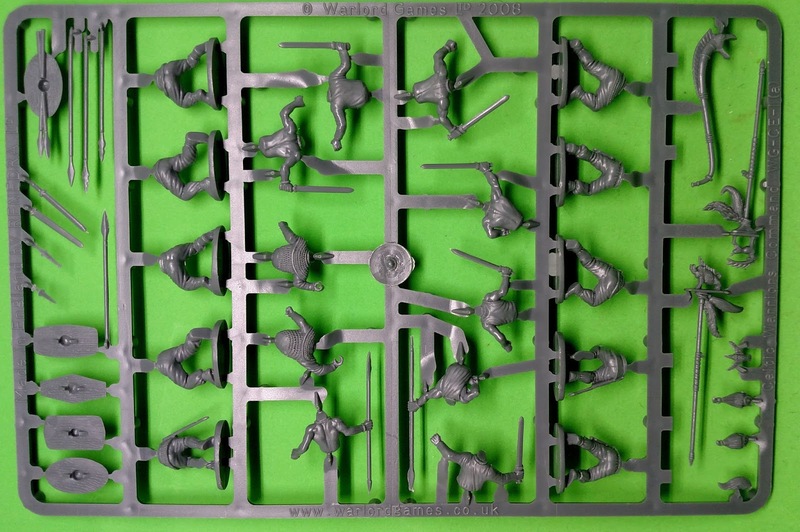 So after the three boxes (40 warriors (4 sprues of 10)) warriors, there is a box of cavalry. First off you get a sprue of warriors - which is ok, but I have to wonder if the cavalry ought to have different weapons than the infantry. 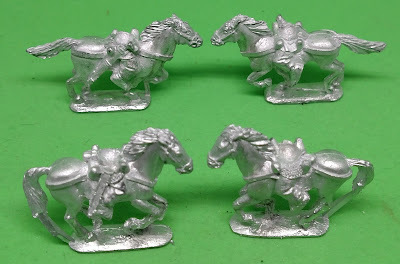 However since they are med cavalry they only get TC(1), so I guess the swords and shields (again, half shields) is ok. 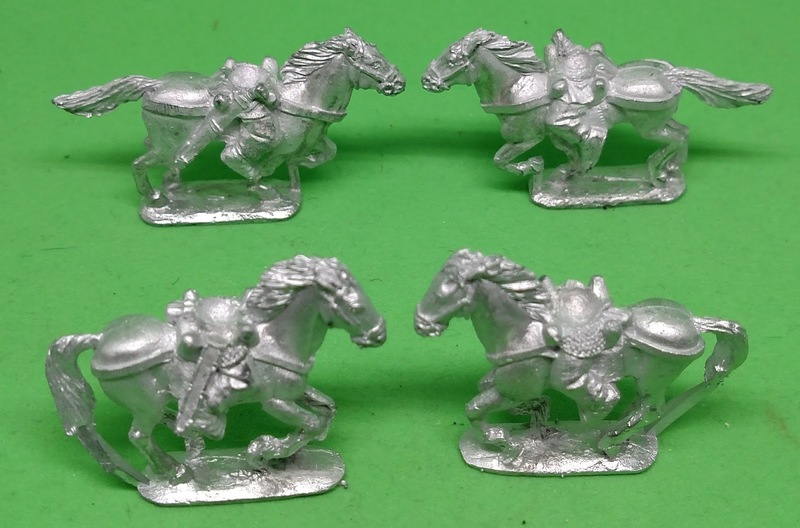 There are five horse models, giving plenty of variation for your units. 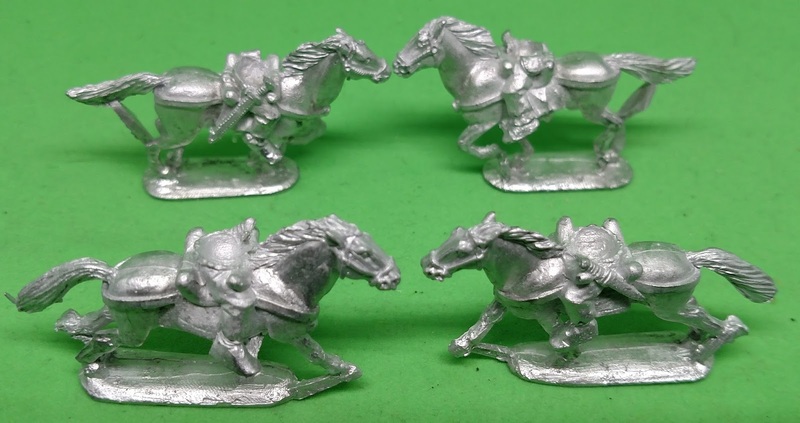 I don't care for having the legs sculpted onto the horses. I can see why this was done financially (making plastic cavalry legs would have required a third warrior sprue), but it really makes conversions from these very difficult. 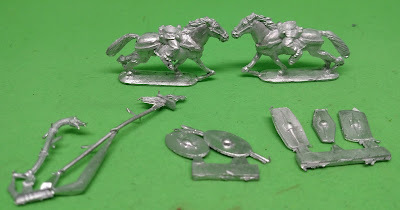 They did include 5 metal shields so all the cav can have one, and a full set of decals, which will be used on the additional infantry models (once I get more shields - which are metal and come in packs of 20 - I assume they are simple four sets of the ones here). 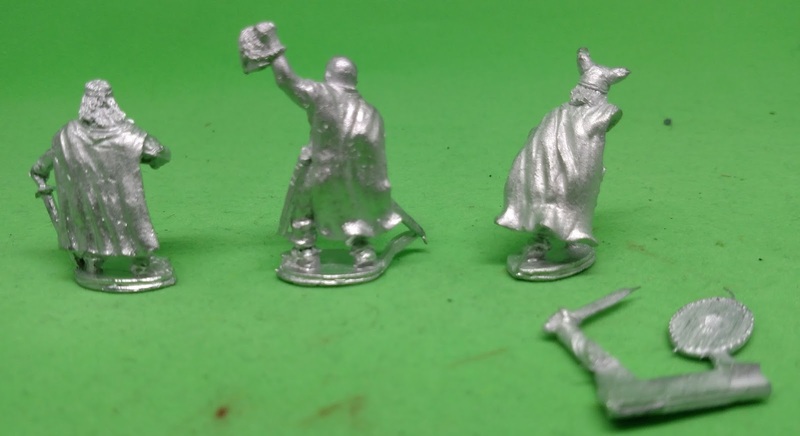 The army also comes with two blisters of eight archers - of which there are four sculpts. I like these as they look like a unit that would actually be in battle. I like the two sculpts that are kneeling, as they then would naturally be in the front row so the others could see over them. The deal also comes with an army standard bearer. 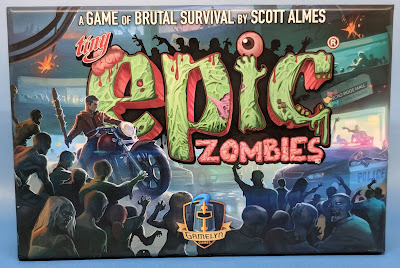 The face on this threw me off for a bit - at first glance it looks like is a vampire - with the accentuated brow leading into the hair that implies a pointed, and then a mouth full of fangs. I then realized the jagged mouth was actually a mustache and beard - so perhaps he won't look quite so bad once properly painted. Finally a blister of three chieftans is included. I see them as a heroic king, a berserker, and a more active hero (with separate arm and sheild). The quality of everything is top notch. 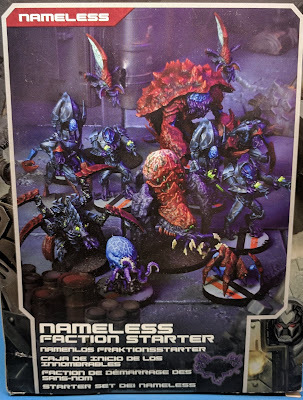 I'd like to say that I'm looking forward to painting these, especially doing a little freehand work adding tattoos to all of them (I kind of enjoyed doing the tattoos when I painted up the Kalyshi Dreadball Team). However I have said that my son could paint up this army as part of our escalation league (since he doesn't have any real interest in building a historical army). Ultimately it is a demo army anyway, so I'm not vested in making it a great army (not to say he won't do a great job. On the contrary, his skills are getting to the point that he may be a better painter than I am (though like me, his favorite part is converting models, not painting them). The one thing I don't like (and wasn't anticipating) was that they would not have enough shields for all the warriors. So for each box of 40, you need to buy another pack of 20 shields, as well as more decals (I'll need two sheets of decals). 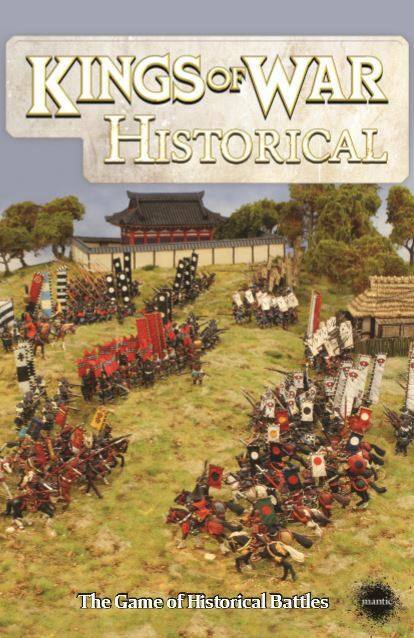 Not being a history buff, I don't know if this was based on how the units actually fought (i.e. was it more of each warrior furnishing their own equipment instead of the army itself supplying them? Is this simply an army that is struggling for resources, so can't equip everyone fully? Were they not able to fit them on the sprue? And if it is the last, then why not include the metal bits to finish them off in the box (even it it raises the price a bit? Regardless of the answer, looks like I'll be making another small order to Warlord to finish these off. Very nice stuff that you have there. And very nice pop reference.